The art of cartography is about as extinct as the art of the written letter. What need is there for a hand-drawn community renderings in the age of instant information, when most people have GPS maps on their cellphones? No need at all. But Los Angeles based writer Eric Brightwell doesn’t care. Taking his inspiration from the colorful, sometimes whimsical, often not exactly to scale maps that were popular in the early 20th century, Brightwell has created a cartographic journey though Southern California hearkening back to a much simpler, but no less keenly inquisitive, time in our history. 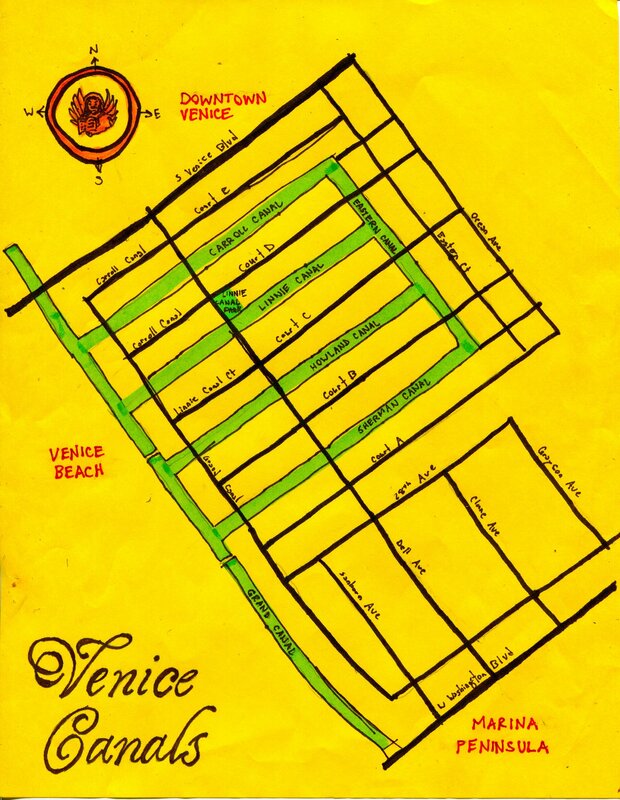 Being a California native, I’m terribly fond of this style of cartography– the mistmatched typography and rather askew geography which was often the result of the rushed booming years of California tourism. Some of these (the simpler ones) remind me of summer vacation road trips with my parents. Every little roadside diner had paper placemats with little maps of their local community that I invariably saved, maple syrup stains and all . . . until my dad cleaned out the car after we got home . . . ! Those are TOTALLY fun — thank you for sharing. Nice post, and thanks for bringing Brightwell’s work to a wider audience. Congratulations on being freshly pressed! I love these maps! Thanks for sharing them! Love your post – there is a website I think would be just up your street (so to speak) I am not connected with it in anyway but I check it out regularly it is called Strange Maps. full of weird and wonderful stuff. Congrats on being FP’d! I love old maps–the art certainly has been lost in the more recent ones. Several artists have been working with maps that I’ve seen. Quite lovely! such a cool post. i love maps. i used to collect them, i almost had one from every state. i don’t know what happened to them. Great work. I loved the Venice Canals! Love your blog, Kitty! And, if only cartography were the only lost art. Well, I guess that’s evolutionary progress. These are great! I remember when we used to have “novelty” maps like this – it was easier to get information at a glance! Very cool post, with pics that were great to look at… I share the same view and was actually just in Southern Italy for 2 weeks where I can assure you that cartography is very much still popular. I bought a silly fabric printed one, but it shows what agriculture along with famous monuments are in the Southern part – ones that were not for sale, i.e. framed and proudly shown in nearly every restaurant, were either really well done modern ones or some that went back as far as the 1600s. One in a museum even showed the Roman empire, as roughly mapped as it could be at the time. Very neat post. thanks for sharing! Strolling Through Istanbul: The Classic Guide to the City by Hilary Sumner-Boyd and John Freely has hand-drawn maps in it – very cool! I love maps like that! I went to a cute little shop in Nassau, Bahamas and found a beautiful map of New Providence. I love old maps. I find myself nostalgic for cartography and letter writing. Great post! seriously . . . what is going to happen to us when all these satellites come crashing down? Cartography is a valuable tool. The maps are beautiful. Sometimes you can find old linen towels w/ various states stitched in. Cool stuff! I’ve always been in awe of cartographers ever since I was little. How did they know the shapes of lakes, the size of cities, where state lines begin and end? This post brought back that feeling of awe and what’s even better is that cartography truly has become an art form of its own! I like the way you put that. I always loved those U.S. puzzle maps of the states growing up as a kid – where the boarders were, what separated them and why? Good thing my parents pushed them on me so that now I have half an idea of where the hell things are today. I guess that’s the inevitable end for many skilled crafts – only the lucky ones carry on as an art form of its greatest examples. love it! cartography is one of my preferred art forms and I cannot wait to make my next map. you have inspired me to pick up my pens again! thanks! and congrats on being fresh pressed! This may not be right up your alley but since there were so many respondants I thought to include something different and new. Thanks again. I just stumbled upon this site the other day which seems like it would be right up your alley, its called They Draw and Travel. Beautiful hand drawn maps by artists all over the world. If I could draw I would totally do one of these! Enjoy! aw thank you! i’m glad i stumbled upon yours as well. 🙂 glad you liked the site! Thank you for this wonderful post. In an age where technologies (e.g. GPS) seem to come between us and the world all too often, it’s fantastic to see Brightwell’s strategy for engaging with space as he sees it and knows us. It seems to leave us more room for mystery and exploration, which, as one of your other comments said, is a lot of fun! I like these type of maps! Always something unique to them. Like the first map. Miami is a place where this type of map is a real treat to peruse. Have seen several. These maps are truly cool! Cartography-as-art – a whole dimension beyond those boring you-are-here atlases. To me the amazing thing about all these maps – modern and old – is that the further back you go, the more art-like they become. If you dig through old antiquarian shops you can often find some real gems (there was a shop in Amsterdam, near Dam Square, that had a lot of out-of-print reproductions). The bizarre part about these wonderful pieces of human abstraction is that it’s not too many centuries since these maps were state secrets. About the time Elizabeth I was on the English throne. Because back then most people knew their local area, but not much else (“here be dragons”) and any government that had an accurate map could plan an invasion. Sad but true! I like your take on this Matthew, and you’re quite right. I also think that what you said is true of print in general. The further back you go, the more artistic printed material becomes– whether we’re talking about maps, books, manuscripts, sheet music, etc. Not to in ANY WAY suggest that today we don’t have truly exceptional artists who have rather resurrected the art of printmaking itself (take a look at ANY Communications Arts magazine for proof), I mean simply there is an irreplaceable sense of down-home personal expression in these vintage pieces, obviously on account of the necessary hands-on nature of the production process. We are so fortunate to have so MANY forms of personal expression today– what cartography reminds me is that, not so very long ago, visual communication wasn’t so easy as point, click, and print. It required a lot of time, effort, passion, and plenty of imagination! I’m a professional geographer and budding cartographer, but I’m telling you…those old hand drawn maps from the time the new worlds were discovered and you know, earth was found NOT to be flat – those are the best. Any map that makes sure to include where the sea monsters are because the area hasn’t been explored yet is alright by me. Great post! Wow! 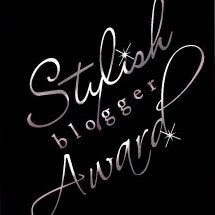 I’ve never been FP’d before, so I’m quite overwhelmed at all of the replies and I can’t wait to visit each and every one of your blogs! Thanks so much for all the kind words– it is *quite* wonderful to know there are like-minded souls out there who still appreciate this sort of thing!! 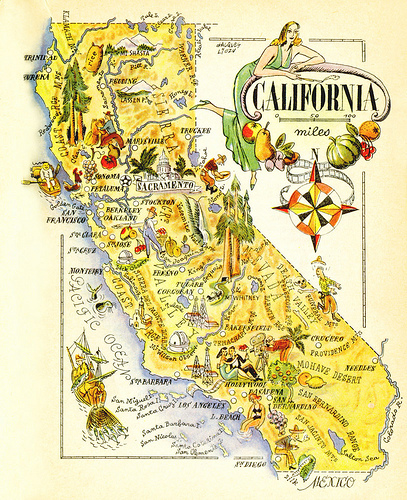 I love maps and I love California–especially vintage California–so I love this post. Congrats on being freshly pressed! These are gorgeous! I especially love the first one and the last! The historian in me loves the drawn maps from the Age of Exploration and the founding of the colonies here in the US. Good post! I love maps. I love them so much that I still have a road atlas and have yet to use a GPS. I papered my bedroom walls with maps when I was a teen and wanted to be a cartographer… until I realized that I couldn’t cut the math-stard. Many a night I used to stay up late creating imaginary maps, letting things flow, and with it a backstory/history for the map. There is something warm and inviting to the psyche and imagination about paper, ink and hand craftsmanship, even the mechanized modern maps. Mapquest and GPS, while handy, have made things cold, quick and boring. Cheers for the reply, and I couldn’t agree more. Warm, inviting, imaginative and, at the end of the day, artistic. Mmmmm…. cartography is probably one of my favorite things. My dad used to collect maps (he traveled the world while in the Navy) and has recently passed his collection onto me. It truly is a beautiful art form. Well, old maps could be great souvenirs. I love those vintage maps written on the parchment. The Maps are Really Cool…Why dont u make one worldmap…. Great post – I can’t get enough of maps myself! I love how the art on the first map almost looks like tattoo flash. Thanks for sharing. Great maps! Thanks for posting. They look amazing, nice maps! I love old maps! Thanks for sharing. Whenever I see some wall hangings of old maps, I always inspect them. Its so nice to look at those old terrains of famous places. This is fascinating! I love old maps–and especially old guidebooks. They can be fascinating, enlightening, and hilarious all at once. Cool things. We are going for the first time to California in August, and these maps would be fun to have. I will definitely look our for it:)))) I remember it was more of it before, they should continue to make them. It’s so refreshing o look to the past to see what methods they used to communicate. These maps were effective and can still be used today. These are fantastic, I love the hand drawn look, I love maps too! These remind me of those maps we all used to draw and label in school, only much more accurate of course. the animation is so cool. the colour. fantastic duh! Glad i stumbled across your post/site. Love the maps. Do you know the book, “You Are Here,” by Katharine Harmon? 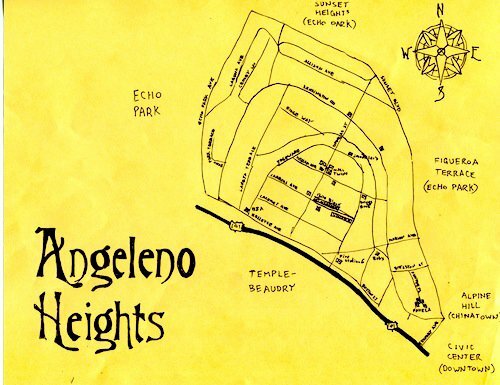 Fabulous artists’ maps of all kinds. They have such a retro feel to them like 60’s petrol station art. 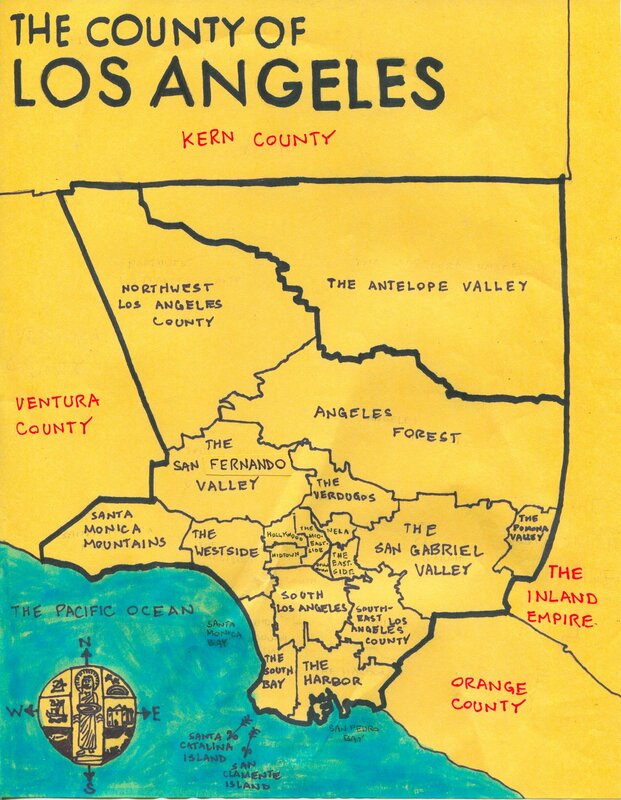 I especially like that it was a map of California- especially because I just visited the Los Angeles County. California pride! Thanks for sharing this post! i think by adding art to cartography makes the map have more edge and character compared to the typical map we see on our phones. Thanks so much for bringing these wonderful, colourful maps to our attention. I love making semi-fictional maps with an imagined history, and it’s inspirational to view the creative cartography of other artists. I love that map of California! Avid fan of Cartograply …. and creative holiday posters from halycon days gone by, when people had time to stand and stare. Congratulations of being fp – enjoyed your blog. I love these kinds of maps. They’re really something to enjoy, and since they’re not always to scale, you can’t always rely on them for direction. But if I could ever get my hands on one to keep, I definitely would. i think the old fashioned maps are far more fun than sat nav. we used to have a jigsaw of england that had shakespeare, some cows and rain. fun! We need to remember how it was before Google Earth. My good friend Rick studied in Cartography – well something to do with maps, geography, and math – and he is definitely successful in the field. However, it isn’t hand drawn anymore, but computer programs that make up the maps… everything is becoming more and more digital, but It’s the way of today’s world. I still want to purchase a hand drawn map of the world and hang it in my room. Dear Fellows, I have not seen this kind of art since I was a boy in the fifty’s. I like your find and truly enjoyed it. thanks. It’s always nice to see something novel pop out of the blog swamp. Love it. Thanks. Cool! Reminds me of the map pstcards from the south of England I used to buy back when I was a lad, it does. Cool! A lost art indeed! Congratulations on being freshly pressed! I love maps and especially those whimsical ones that include more than state lines, cities, interstates and routes. Hence why I own a hand-drawn map of my home region and hang it proudly in my den. I never tire of looking at it, spying something new with each gaze. I’ve been on the hunt for such a map of Key West and Las Vegas (two of my favorite getaways), to round out my collection. Enjoyed the post. The images are wonderful. Pingback: Pendersleigh and Sons… and the Lost Art of Cartography (via The Kitty Packard Pictorial) « I am a Woman, hear me raowrr! but I love hand-written pictures. it ain’t a map, it’s art. Very nice. I love old maps! Not only are they beautiful, they give you such a rich view of what the world used to look like. these maps are so colorful, kudos for your attempt to keep cartography alive. Cartography isn’t dead – it’s just digital. And that means more cartographers are doing more mapping more easily than ever. And some of those maps even end up on paper. It’s an Art form by itself with a fascinating history. congrats. The pics attract me! I think the good drawings could tell everything, sometime work much better than the words. Hope this will remind people the lost art! I’m absolutely in love with the first map from the 1930’s. The workmanship there is beyond words. Those sorts of mixed drawing and topographical maps are just lovely. I wish we had more of them today! I love, love, love this!!! Maps tell incredible stories and I’ve been trying to figure out the best way to incorporate some into an empty wall in my home. This is really inspirational! Thanks! Cartography is not completely lost! Nor I think will it ever fully be. People love stories and drawings of far away places; they may not always go together, but when they do a beautiful map is sometimes born. Thanks for sharing this interesting post!!! Cartography is not dead in the fields of geology and geography. It has become more complex and informative, using programs such as GIS to implement multiple layers of info into a map to allow the analyzation of complex spatial data.